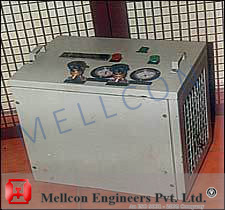 Mellcon offers fully automatic and effective ready to use effecient refrigerant recovery system with power range from 120 watts to 1200 watts. It has a volumetric capacity range from 4-6KG/HR to 40-45KG/HR. To start the unit connect the service hose to the lower side of the refrigeration system and press the start button. The unit will start operating and the refrigerant gas gets extracted and distilled. It will turn off automatically after all the gas is removed. It will pull a 10 degree vacuum and if a positive pressure is sensed the unit will start automatically. Suction and delivery gauges and temperature cut off circuits to assure the safety of the equipment. An hour meter for determining when the maintenance is required. Control panel to monitor the automatic operation.